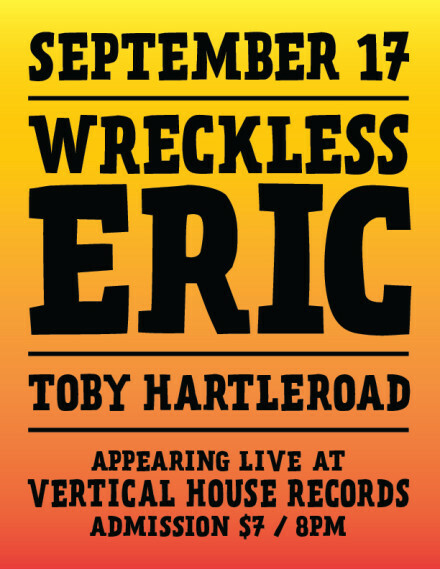 THURSDAY SEPTEMBER 17 @ Vertical House Records! Nothing Eric has to say sounds like it was said by someone else first. His songs deal with ramshackle existences, the tenuous nature of life, love and fame, depression, injustice, pain, depravity and death, always delivered with indefatigable optimism. Eric began his recording life on Stiff Records in 1977 with his enduring hit Whole Wide World when he was little more than an ex-teenage art student. Eventually he sidestepped the mechanics of stardom to become Britain’s biggest underground household name, much loved and much misunderstood. He lives in bohemian splendour in upstate New York in what he describes as a budget pop star home where he continues to record other-worldly pop records. He signed to Fire Records in 2014. A new album is scheduled for November. Wreckless Eric is Eric Goulden. He was given the name to hide behind. After a while he realized he was stuck with it. Onstage he hides behind nothing, he tells the truth with big open chords, squalls of feedback, lilting enchantment, bizarre stories and backchat. Some people can’t take it. Thirty seven years of touring have left him in good shape. He’s coming to town.